Inder Loves Folk Art: KCWC: The Grand Finale! 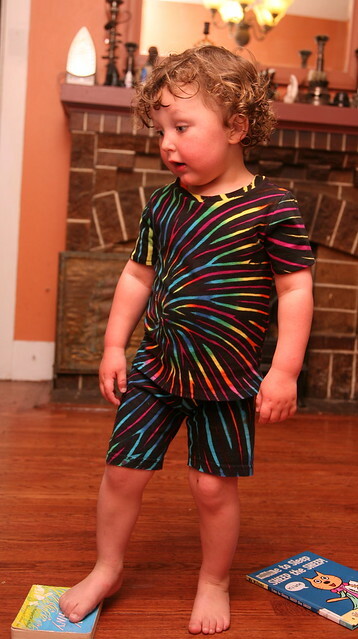 Yesterday was the final day of the Kids Clothes Week Challenge, and my last project for the week was a new pair of summer PJs for Joe, refashioned from a size XL men's tie-dyed shirt. This project was special to me because this t-shirt was tie-dyed by a dear friend of mine, Marc, who died much too young, about six and a half years ago. I miss him a lot. His many talents included geology, obsidian knapping (you know, making arrowheads and spear points), throwing pottery, and crazily enough, tie-dyeing. Tie-dye isn't really my thing, but Marc's tie-dyes are really beautiful and full of vivid color. So I've held onto this bleached and tie-dyed XL t-shirt, which was way too big for me or anyone I know, for many years now, in my knit fabrics stash, waiting for the perfect project to present itself. On Saturday, I was going through my knit stash, and pulled this shirt out. Joe, who is really into colors right now, and really, really into rainbows, was immediately impressed: "Rainbow!! Red, orange, yellow ... pink ... all the colors!" I just love it when Joe says "all the colors!" I think you have to be there. "Joe, would you like a rainbow shirt?" I asked. "Yes! Rainbow shirt!!" he eagerly replied. Then he had an even better idea. 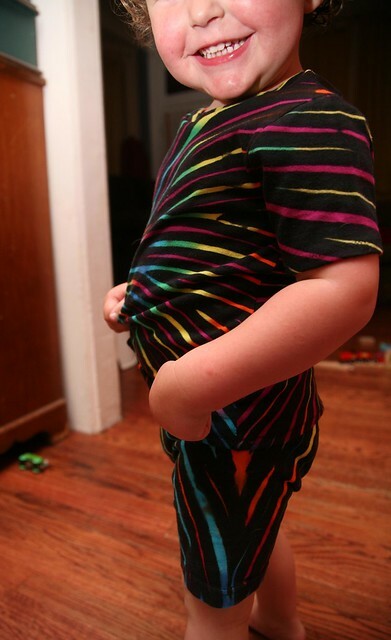 "Rainbow PJs!" So, rainbow PJs it is! Pretty groovy, huh? I used Made by Rae's Flashback Skinny Tee pattern to make the t-shirt, even harvesting the ribbing from the adult t-shirt for the neckline on the little version. With this stable, easy-to-sew interlock, sewing up this pattern was a dream, and I didn't run into any of the problems I encountered with my last version. To make the shorts, I just shortened the Sleeping Johns from Growing Up Sew Liberated. I have made so many versions of those Sleeping Johns now - it is such a simple and easy pattern, just one pattern piece. I centered the middle of the tie-dye on the t-shirt, fit the little sleeves into the grown-up sleeve pieces, and was able to squeeze the shorts pieces out of the sides of the t-shirt, which didn't have side seams, utilizing the hem of the shirt as the hem of the shorts. 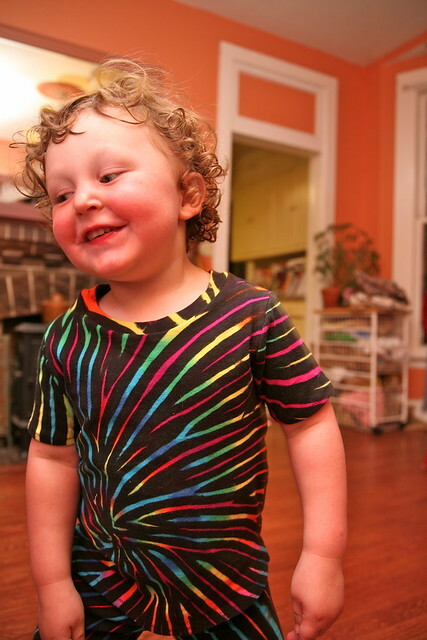 Joe is pretty pleased with his rainbow PJs. Check it out - he even posed for me! And that wraps up KCWC, Spring 2012! I am definitely a little tired, but what a fun week! I felt like I was part of a bustling, inspiring, kids' clothes sewing community (because I was!) - and I made a few things that Joe really likes, too, which is extra rewarding. Next up, the fun task of trying to fix/de-bug a few of the items I made this last week, to make them even better and more wearable. Not my favorite part of the sewing process, but important and well worth it. How are y'all recovering from KCWC? These are just PERFECT! You win at repurposing. And Joe looks so darling and pleased! Thanks, Rebecca! As you mentioned, this tie-dye was a bit overwhelming as an extra large t-shirt. I think it's perfect as little kid PJs. Too awesome. Clem would adore these! He's totally into rainbow stuff too. And it's so great that you got to use the fabric your friend created. I've never seen tie dye that spectacular before! I've definitely missed your presence this week, Jane! Love them! The tie dye is great and it's so nice that it's special to you. I'm glad KCWC is over, although I did end up doing some work today to finish off the vest I didn't get to finish last week. I just couldn't stand to leave it unfinished...time for a sewing break now though. I hear that! I'm sure I'll do some puttering this week, I always do, but I will be glad to spend some of my evening time doing things OTHER than sewing, that's for sure! This is beautiful. Great tie dye and a wonderful re-use. And I agree with Rebecita, your guy looks so happy. Nice all around. Thanks! There's nothing like making clothes to order for Joe and having him be pleased with the result! Very cool and nice that they've got meaning too. What a week! Been really enjoying seeing all your creations. These are great, and I love Joe's happy smile at his new all the colours pj's - very special indeed! Under, you are a sewing genius. Joe clearly appreciates your creativity more than on the Halloween shark costume! A sign of his maturity? And I enjoyed the backstory about your tie-dyeing friend. Thanks Ellen! Yeah, he's getting a bit older, so now, if he some say in what he wears, he can be more cooperative (if it's not what he wants at that moment, however, things get hairier!). But it also helps that this outfit does not involve a giant felt shark headpiece. Joe has always been sensitive to things on his head. These are perfect!!! 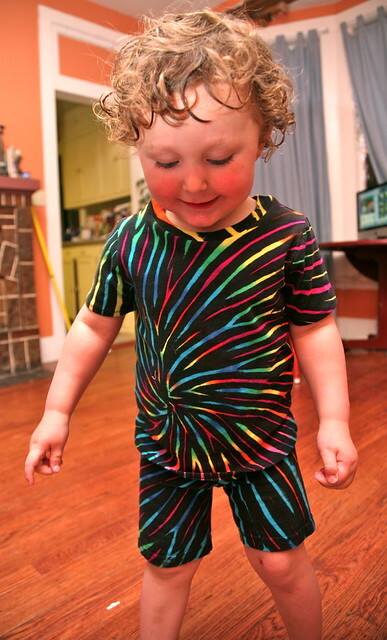 That tie dye is really neat and just right for pj's. Thank last picture is so awesome!!! If there was a prize for best modeling Joe would surely win for that one! Those pjs are very cool and a lovely way to remember your friend. Joe looks so pleased to be wearing them, very cute and I love his curls. I'm pretty tired out after KCWC, I was a bit ambitious on Sunday so ended up sewing most of last night to finish it off. Definitely having a break from the machine tonight though. Thank you! These shots show Joe's curls still damp from his nightly bath and comb-through (not his favorite part of the bath! ouch! poor kid). I slept so well last night! So I'm feeling a bit better now, but yes, it was an exhausting week! These pjs are so cute, agreeing with the others! I loved reading the backstory and love seeing a meaningful repurpose. So true this pattern would be so overwhelming on a big shirt, but perfect for kids pjs! I'm worn out after KWCW too. But it just strengthened my addiction and I have loads of ideas. First up, tackling some more knits since I have all that installed on the machine. Tell me it gets easier? !